While it’s still too cold to go out and laze in the sunshine (brisk walks yes, but not sitting to sketch yet), I’m doing a bit of fantasy interior decoration. Current ideas: get taller bookshelves to take the place of the smaller shelving units crowding the floor space. I think (maybe) we could sneak the roll-top desk into the living room if there were fewer bits of furniture. Unclutter, neaten, straighten. Go one step forward, and then regroup with the vacuum cleaner. Get out the graph paper, and work out where to move what we have. So far, I’ve only begun vacuuming and laundry. Probably that’s as far as I will get today (beyond the graph paper). 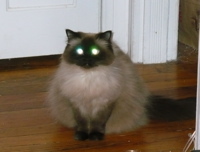 Once the gale is done, I will get outside again. In the meantime, sieze the day and grab a broom. 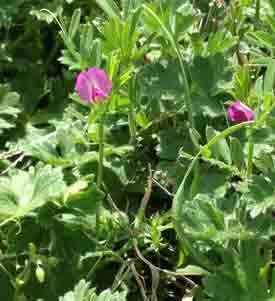 When visiting the US National Arboretum, I stumbled over patches of spring ephemerals (spring beauties, wild violets) and then a patch of hundreds of what looked like sweet pea blooms or rogue snap dragons. After looking through the US Wildflower database, I ruled out rabbit-pea/goat’s rue (Tephrosia virginiana), round-leaved tick trefoil (Desmodium rotundifolium), and crown vetch (introduced). I think it’s just wild sweet pea blossoms (Lathyrus latifolium). What do you think? There are slow motions toward spring cleaning. Emphasis on the “slow”. It’s hard to work up enthusiasm for cleaning while the outdoors is so beautiful…. We went to the US National Arboretum last weekend, before the weather turned cold again. There were so many people hiking, basking in the sun, and taking photos. 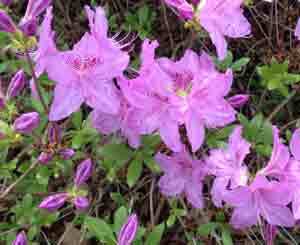 The azalea gardens are a great draw, and they have already started. We did not see the latest attraction — the bald eagle’s nest — because the roads were closed off to pedestrians and cars, to protect the new pair. It’s been about 70 years since there was a nest at the arboretum, so they’re being quite thorough (including volunteers guarding the roadways to keep us tourists out). The bees made up for no sightings of eagles on wing. 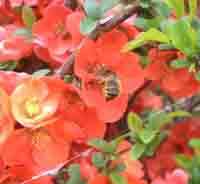 I caught a photo of one in the ornamental quince bush in the Chinese gardens. During a meeting late this afternoon, I could hear spring peepers in the background. The chorus started as a coworker droned on into the dinner hour over his slide presentation that may have been of interest to me*, but I just got distracted. I began mentally estimating how many spring peepers can support themselves in the drainoff “pond” in the mist of the section of the office property with trees on it. And also, what does it sound like when everyone in the office park leave and the spring peeper chorus really gets started? Their song is a true sign of spring. The crocuses are also finally blooming in the front yard, so I hope that soon it will be time for afternoon walks again. *Or it may not have. I’ll leave it a mystery.